St Johns Golf is located just off Interstate 95 and State Road 210. The golf course was designed by Clyde Johnson and is known for consistent quality and customer service. The club was ranked as the 5th best course by GolfNow.com and has consistently nationally ranked for customer satisfaction by the National Golf Foundation. All of the customer service qualities carry directly over to the catering and event staff that help the couple with the wedding day. The staff makes this venue one of my favorites to work with. This image of the bride and groom was taken on the highest point on the golf course. 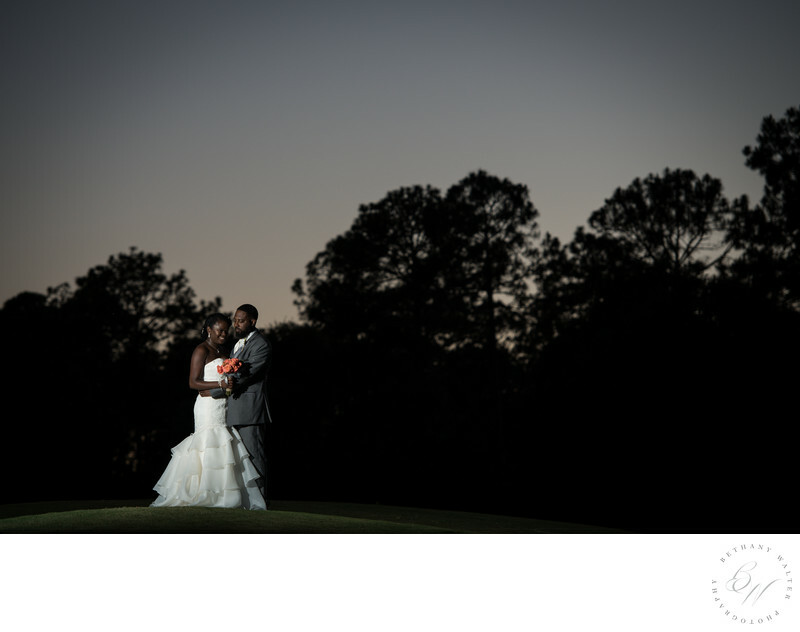 We stepped out of their reception for a few minutes to capture some night time portraits. I love when couple's will step out with me and the variety of pictures we get. The night time pictures allow the couple to have gorgeous, daytime images, and the dramatic, contrasty night pictures from the wedding day. When I ask a couple to take a few minutes from their reception, I make sure that we have everything setup and ready to go to cut down on the time they're out of their reception. In this case, the staff at St Johns Golf and Country Club had our golf carts ready to go as soon as the bride and groom stepped off the dance floor. With our lighting equipment already setup and a quick drive to the course, we were out of their reception for 15 minutes. That even included time for the videographer to work with the couple as well. Location: 205 Saint Johns Golf Dr Saint Augustine, Florida, FL 32092.